Q. Are you a kind of Sherlockian? What’s Sherlock Holmes for you? 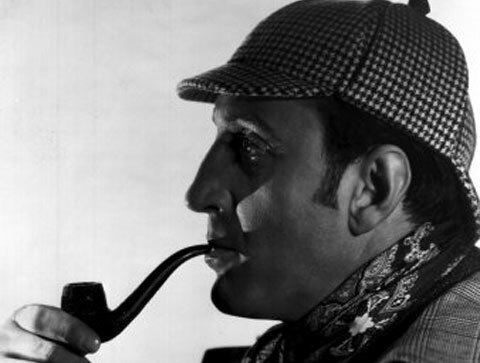 “I grew up with Basil Rathbone’s movies and, of course, I read all of Doyle’s novels and short stories which one could never hope to solve, even though the clues were all presented to us (unlike those of Agatha Christie! ), but also for the quality of the language which is of course a large part of their appeal. It took me a long time to appreciate Jeremy Brett’s characterisation and I am also rather partial to Peter Cushing’s portrayal, the perfect gentleman who I had the great privilege to interview when I was writing for film magazines back in the early 80s – but I cannot watch the new ‘Sherlock’ TV series with its modernised ‘re-imagining’ of the character. That’s blasphemy as far as I’m concerned! I know it has a huge following but I think it’s a crime foisted on the public by Colonel Sebastien Moran, damn the blighter! Holmes, for me, is a rare intellect and individualist operating in the midst of a very repressive society and that aspect is lost when it is updated. Doyle, who was raised in the squalid tenements of Edinburgh, was clearly rallying against a class conscious society and in almost every tale he prizes intellect and imagination over status and privilege. Q. One of your favourites in literature seems to be H.P. Lovecraft. A song cycle as well as a new book written by you are showing that. What’s the fascination with him? And can you tell us a little bit about your book, especially your very special ‘Roland’ way to write a biography? I had to write a whole book to explain [H.P. Lovecraft’s] appeal, so you’ll have to forgive me if I can’t answer that in a sentence or two! If I had to, though I’d say it is his ability to convey the primal fears lurking just beneath the surface of our conscious mind and in the world he created. He wouldn’t have had such a profound and lasting impact on popular culture if he hadn’t struck a chord with something deep within our collective psyche and if he had not articulated fears that we find difficult to confront. As for the ‘Roland approach’, I can only say that I try to look for themes that have not been explored before but without getting too academic and seeing things that were never intended by the author or individual I am writing about. When I write on historical subjects—true crime or the Nazis—, I am looking to examine the mindset of the perpetrators, not simply re-telling the story and when I’m writing about occult or supernatural subjects I try to take the sensationalism and fear out of the unknown. I’d like to think that even the Jack The Ripper book found the humanity in the subject by having an empathy for the victim and the conditions in which they lived. With the Nazi books, too, it was the courage and the dignity of the victims that drew me, not the criminal nonentities who manifested the base instincts that we all struggle to control. I almost always write the music first and then think about what theme best suits the instrumental setting and the mood. I had a gentle wistful acoustic song and was looking for a suitable subject when I looked up at the sky and ‘saw’ airships emerging from the clouds. I had read somewhere of an isolated incident during the First World War where a single Zeppelin had dropped a bomb on London and I thought ‘what if there had been an armada?’ and how that would wipe out the serenity and innocence of an era in one stroke. It was only later that I discovered the ‘Invasion’ literature of the period through Michael Moorcock’s anthology ‘Before Armageddon’. ‘Wyndham Hill’ was simply an idea that came after reading H.G. Wells’ ‘Argonauts of the Air’. I think I had read it many years before I wrote the song but those vivid images remain with one forever. But it’s not simply the quaintness of the period that attracts me, it is the idea that one visionary is willing to risk his life to glimpse the beyond or to try something no one else dares to do while his fellow citizens simply gawp in wonder and fail to see anything but a sensational drama unfolding before their eyes. I had never considered those Victorian/Edwardian songs to be steampunk, but then steampunk covers such as diverse range of music and is more to do with a shared theme common to the lyrics than the music, but I am happy to be categorised as a steampunk artist if it helps people to find my music. Q. You are called the ‘Godfather of Steampunk’ because of your songs, you have written a book on that topic. What do you find fascinating about steampunk now (in 2014)? When I was writing and recording those early songs in the 80s I hadn’t realised that there was a burgeoning movement or community whose members shared my fascination with fantasy fiction and the 19th century, but since I’ve become aware of all these amazing artists, novelists, musicians and contraptors (model makers), I realise that many people feel the need to escape, if only temporarily, from our characterless consumer society and find self-expression through creating artefacts that are not only functional but aesthetically pleasing. I was particularly impressed by the intricate reliefs created by sculptor Kris Kukski and the art nouveau of Chaz Kemp (who painted the cover for the ‘Professor Moriarty’ CD), the clockwork laptops created by datamancer, the airship pirate armoury invented by Brute Force and the steampunk jewellery by Catherinetterings. But the diversity in steampunk fiction is overwhelming. It’s not a narrow subgenre of science fiction as some might imagine, or a fetishistic fashion statement, but a whole new alternative world of invention and imagination. It’s going to take me a year to get through all those wonderful novels! And the great thing is they are all having such fun dreaming up these incredible things. Q. Do you like those crossovers in literature/graphic novels like “Sherlock Holmes vs. Arsene Lupin” or that anthology “Shadows over Baker Street”, where Holmes is set in the Lovecraftian universe? Or, let’s say, the “League of Extraordinary Gentleman”? I love those mashups when they work, but there is nothing more frustrating when they don’t. I recently had to review a new anthology of Holmes Adventures edited by George Mann (whose ‘Martian Ambassador’ is a wonderful Wellsian pastiche) and I just couldn’t get into the story which had Holmes voyaging to Mars! One of my favourite movies is ‘Murder By Decree’ and I think pitting Holmes and Watson against adversaries from their own period is perfectly valid, even if Doyle wouldn’t have done so himself, or supernatural entities which is in keeping with the Victorian obsession with spiritualism and Theosophy, but anything outside that era is an anachronism, as far as I’m concerned. Q. You are not only writing books on steampunk, Lovecraft, true crime or esoteric topics—you are writing a lot of fiction, too. You have been so friendly to send three playlets to me (which I really love)—and there I was able to meet the Beatles, the Whitechapel Ripper and good old Dracula. What will come next? May we expect a feature theatre play by you? Will there soon be a book with Roland fiction out? It took me a year to write my first novella ‘The Magician of Grimm’ (a fantasy in the style of Mervyn Peake) in the early 90s. I couldn’t devote that much time to fiction again, especially as there is no guarantee it would be published, but I have a full length play which needs finishing and I never leave anything unfinished, so I’ll get round to that now that the Lovecraft biog is out of the way, but my priority this winter is a new album. I like to have a new album out once a year (I guess that’s a habit I got from my favourite artists in the 70s.) 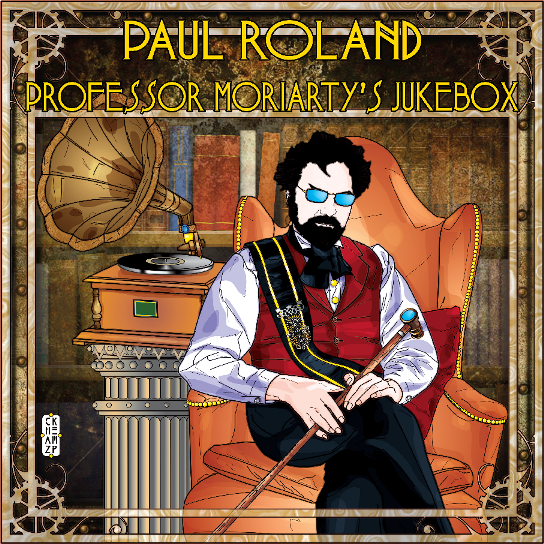 And I have about four albums worth of songs and half-finished songs, including an album based on the ghost stories of M.R. James, so getting those into shape and recorded in the number one priority. To be perfectly honest I would be too intimidated by what has already been written to do that subject justice. The standard is so high. Besides, I think it is always better to create your own characters and environment. Having said that, I was very pleased with the song ‘Moriarty’ on my ‘Demos’ and ‘In Memoriam’ CDs, but that was because it was just a snapshot. I didn’t try to tell a story, which is very difficult to do well in rock or pop without it sounding like a Sondheim musical! That particular song came very naturally but trying to fit a whole album around a story risks being contrived and forced. Besides, I like the three-minute restriction that a song imposes on me. It keeps me to impressions and suggestion rather than spelling the whole thing out or squeezing in a narrative which is not something rock musicians tend to do terribly well, if I may say so. Q. Last time you told me about your fascination of a kind of (fictional?) flamboyance you like in film/literature/music that seems to derive from the Victorian/Edwardian age. Does this fascination continue? Some people would call that retrospective/revisionistic (I don’t). I think that is why I set songs in various historic periods. I wouldn’t be comfortable writing exclusively about one theme or one era. So, I suppose the answer is that I don’t confine myself to one topic or era and I am constantly searching for new influences and ideas. I wrote a whole album based on original voodoo chants for a new soundtrack to the Bela Lugosi film ‘White Zombie’, which is being recorded now for release in the New Year. The chants just came through me over the course of a few days and I didn’t stop to analyse them or think about them but simply gave in to whatever needed to come out at that time. Later I thought about how I could present them and if they might be used as a soundtrack to that film and if I needed to write real words or just sing the wordless sounds like those zealots who speak in tongues when the spirit moves them. This is what songwriters do when they first come up with a tune, only they usually play an instrument to help them bring the melodies and rhythms forth. Paul McCartney is known to have sung ‘scrambled eggs’ when writing ‘Yesterday’ until he worked on the lyrics! I simply played through all the drum/percussion patterns at my disposal at the time and opened up to whatever needed to come through me. A shaman friend of mine told me later that this was a well-known phenomenon and that these were what they call ‘power songs’. It’s a long way from what you asked me, but I think it interesting to discover that there are other ways to be creative. Imagine what an incredibly imaginative novel you could write if you could attain and prolong that trance-like state for the entire time it would take to write it down. It’s a stream of consciousness exercise, but if you could focus it on a specific plot and characters. I think all writers do this to some degree. Lovecraft certainly did but then his intellect would intervene because he feared to trust his unconscious for more than a few minutes at a time and that’s why even his best stories are a mixture of inspired brilliance and the uptight self-taught 19th century scholar who needed to disparage anything that smacked of the esoteric. Q. And, finally, back to basics: Your plans for the next year? Finish those four half-written albums and the play before the next book comes along! Posted on February 9, 2015, in Conan Doyle, Jack the Ripper, Sherlock Holmes and tagged airships, Arthur Conan Doyle, author, Baker Street, British cinema, Edgar Allen Poe, Edwardian, H P Lovecraft, H.G. Wells, Professor Moriarty, Sherlock Homes, steampunk, Victorian. Bookmark the permalink. Leave a comment.